﻿GSCHNAETZLETS. Zurich-style minced meat is made from veal, thinly sliced and sautéed. The delicious gravy, which goes particularly well with another Swiss specialty, the Rösti, is made with onions, white wine, and cream. Whether or not to add mushrooms or kidneys, is a matter of choice – at least in Zurich, the hometown of this Swiss national dish. 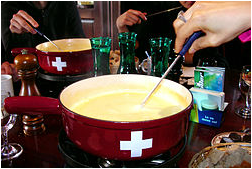 ﻿FONDUE.﻿ Take some Swiss cheese, some white wine, and of course a bit of Kirsch; combine them with lots of love and patience; serve them in a "caquelon" over a "rechaud"; all you'll need are special long cheese fondue forks and some crusty French or Italian style bread to savor Switzerland's national dish. Whether you use Gruyere, Emmental, Vacherin is not as important as following your favorite regional recipe. Christine & Ed are sharing theirs. ﻿﻿PASTETLI﻿﻿. 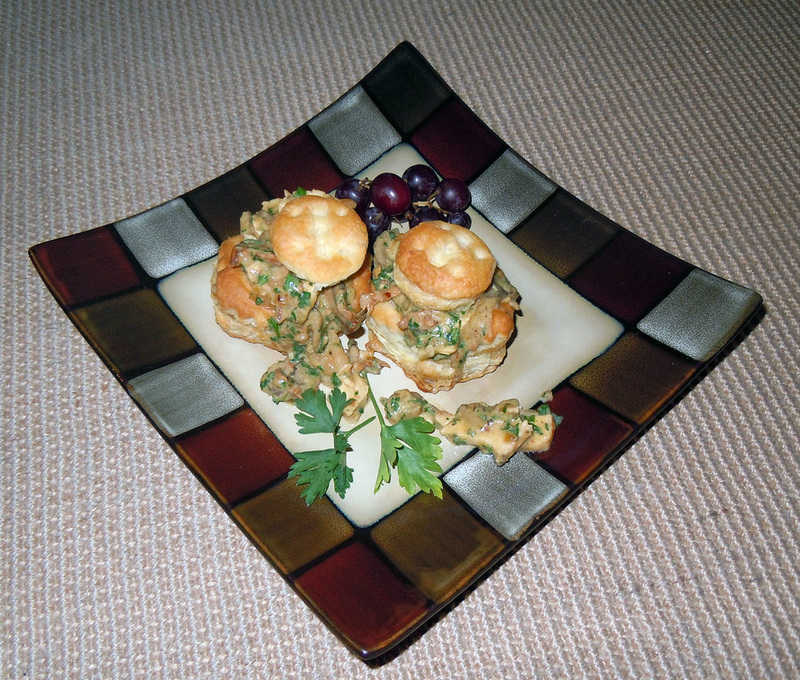 Pastetli or vol-au-vents is a typical Swiss dish﻿ that can be served as a first course or as a main dish. It's always a hit and will bring back fond memories of Switzerland. There are many variants with each region of Switzerland claiming their own. Our recipe calls for chicken; however, some people prefer veal or sweetbreads, and some omit meat altogether. ​SWISS CHRISTMAS COOKIES. In the USA as Thanksgiving approaches you’ll find pumpkin pies, apple pies & pecan pies as well as the condiments to prepare them in virtually every supermarket & bakery across the country. About the same time in Switzerland, tradition kicks in and you’ll find Christmas cookies on the shelves of bakeries and supermarkets. Whether you call them Weihnachtsguetzli, Biscuits de Noël, Biscotti di Natale, or simply Swiss Christmas Cookies, they are truly wondermous, especially if home-baked. If you’ve never done it before, start the tradition. Just follow the recipes Christine & Ed Schaefer have shared with us. ​ BOULANGERIE – PÂTISSERIE. Hearing these two words automatically elicits a Pavlovian response in most Swiss. There is something magical in the aroma of freshly baked bread, and who can possibly resist the allure of an appetizing pastry. We’ll strive to bring you recipes from our members. We’ll post recipes of home-made breads & rolls, cookies, and other delights you’d find in a typical Swiss Bakery-pastry shop. We all have our favorite Swiss recipe of goodies we’ve brought home from the Boulagerie-Pâtisserie, so email them to us. Don’t forget to include pictures of your delights. ENGADIN VALLEY VENISON STEW. La chasse est arivée! You’ll hear this cry of joy from many Swiss if you have the pleasure of visiting Switzerland during the annual three week autumn game season. If you are a carnivore and a foodie, you are in for a real treat. You will find restaurants throughout Switzerland offering a great variety of meat dishes including hare, deer, wild boar, venison and bison to just name a few. As you would expect, each restaurant has its specialties as does each region of Switzerland. In the Engadine you will want to try their Hirschpfeffer served with Spätzli & red cabbage. Bruno Cantieni has shared this recipe with us adapted from Hotel Waldhaus in Sils Maria.